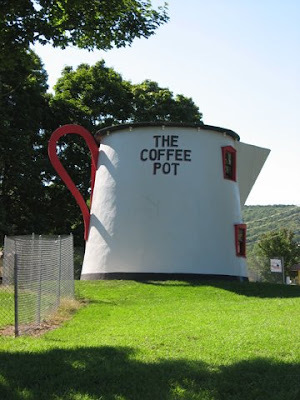 I've driven down Route 1 in North Kingstown, Rhode Island hundreds of times, taking care of the humdrum errands of every day life in my adopted home state of 20 years. 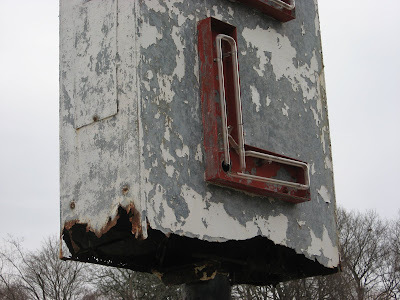 While Sherry was at the CVS drug store picking up some essentials, I wandered over to the Kingstown Motel to take a few snaps of their beautifully decaying neon sign. 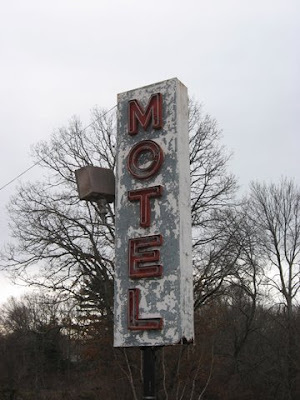 It doesn't light anymore, but the motel manager says when the motel owner made some noises about painting it, locals complained that the decaying state of the sign is such an icon it would be a pity to see it spruced up. 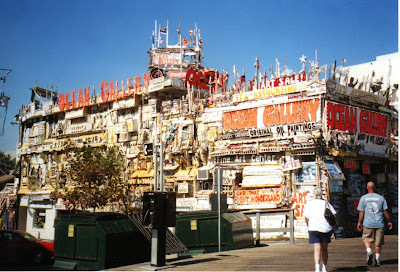 Imagine that...regular people with a truly eccentric roadside frame of mind. 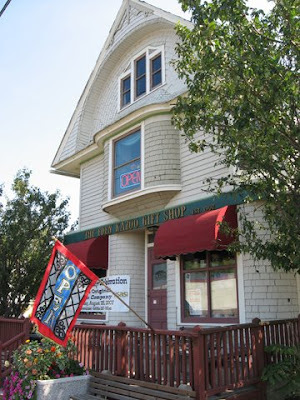 Across the street is a Del's Lemonade stand, closed for the season. 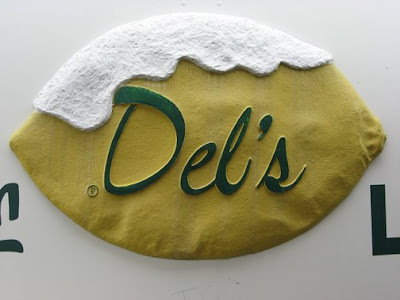 Del's, for all the non-Rhode Islanders out there, is a religion in this state in the warmer months, and has a terrific logo. 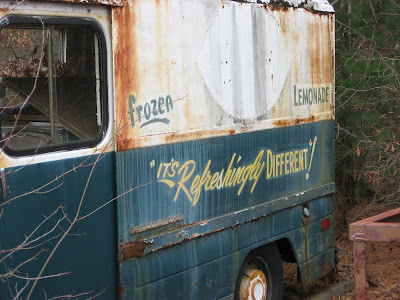 A squad of deteriorating Del's trucks were parked there rotting away, waiting to be photographed. 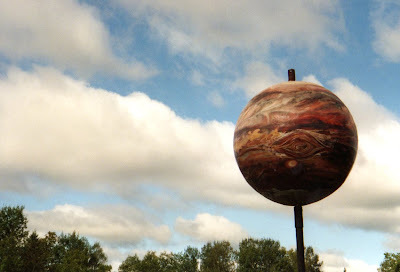 Why, oh why, hadn't I ever noticed this awesome sight before? 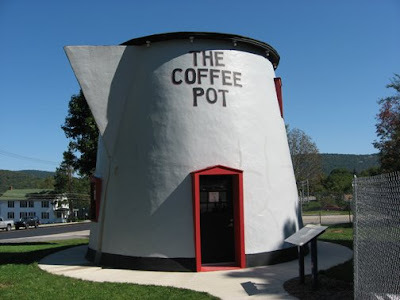 Bedford, Pennsylvania's Coffee Pot: The Greatest Joe on Earth! Born to be wild: Supermodel Cindy Rich and Ocean Gallery's Joseph KroArt Jr.
Yellowstone National Park is a wondrous place full of eye-popping scenery and nature's beauty and weirdness. 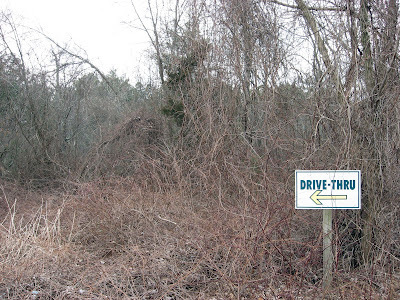 It isn't Disneyworld, however, and they don't coddle their visitors here. 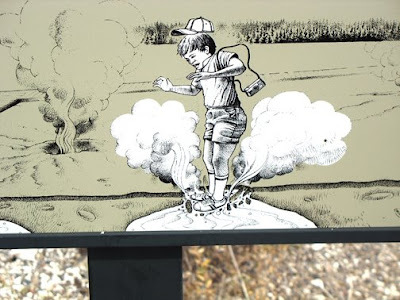 You have to walk everywhere, past a lot of boiling, dangerous, smelly places in a high altitude, past buffalo, elk and the occasional hungry bear. It's amazing how idiotic people can be, putting their children within stomping distance of a bison in order to get a snapshot for Aunt Tilly back home. 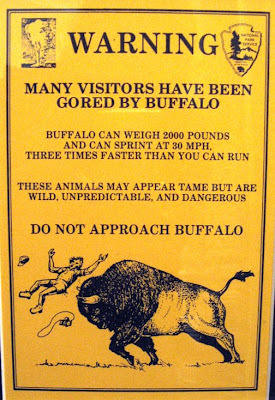 I love the graphics at Yellowstone, warning people not to do stupid things. Boom, there goes a guy flying through the air after being gored by a buffalo. 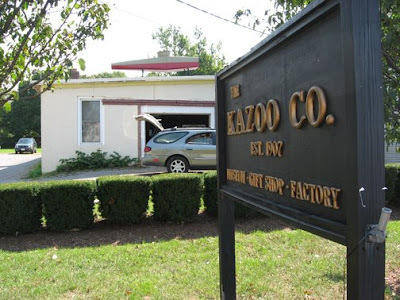 Sizzle, goes a kid stepping in a steaming geyser. 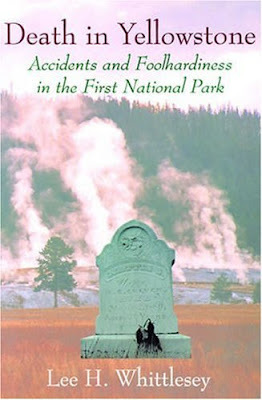 We picked up a great souvenir in a Yellowstone gift shop: a book entitled "Death in Yellowstone: Accidents and Foolhardiness in America's First National Park." It chronicles the 300 deaths in the park since 1870. Check out these chapter titles: "Hold Fast to Your Children: Death in Hot Water," "I Think I Shall Never See: Death from Yellowstone's Falling Trees," "These Animals Are Not Real: The Myth That Can Kill You," "Malice in Wonderland: Yellowstone Murders," and many, many more. Makes for a great read after a long day of sightseeing. 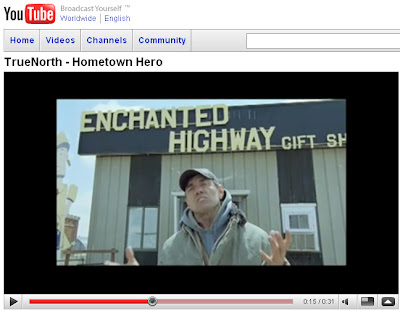 North Dakota's Enchanted Highway is in a TV commerical! 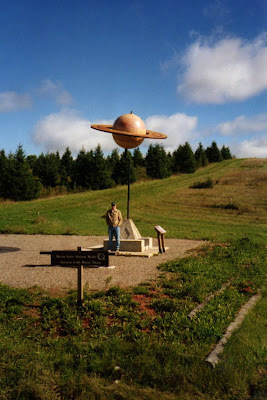 I gushed about North Dakota's Enchanted Highway (one of the best eccentric roadside attractions ever!) 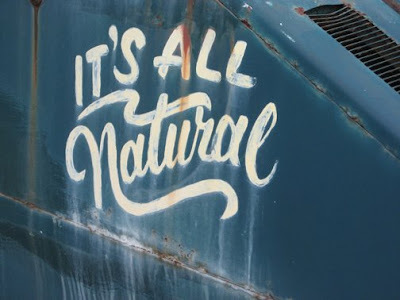 in a previous post (click here) and was delighted to see it featured in a TV commercial for True North nut snacks. 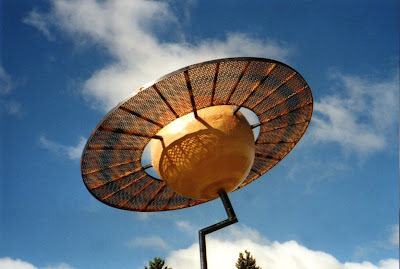 Artist/genius Gary Greff talks about his artwork and saving his hometown of Regent. Check out the video here and buy lots of those True North snacks...they've got the Eccentric Roadside seal of approval. 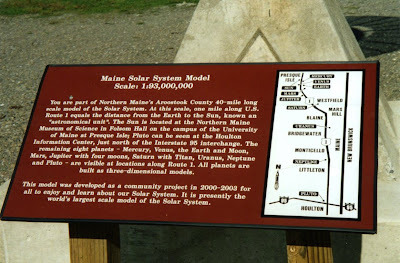 Northern Maine's Route 1 Solar System replica: Out of this world! 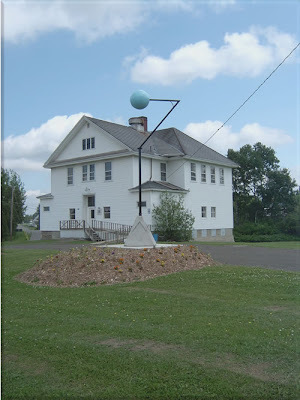 The Bridegwater, Maine town hall and Uranus. If you're not impressed, you don't know your elbow from Uranus. A red fox in North Dakota: "This is the big one! You hear that, Elizabeth? 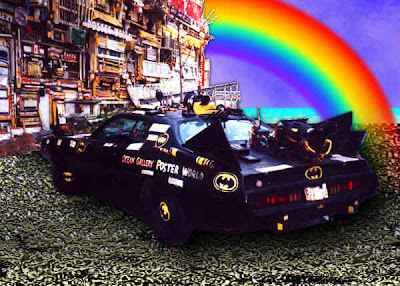 I'm coming to join ya, honey!" Out in the west and in places like Cabela's stores, you come across a lot of stuffed animals. The lobby of our Super 8 motel in Jackson Hole, Wyoming had a stuffed badger leering out at us as we ate our complimentary continental breakfast (and it was for sale, too). 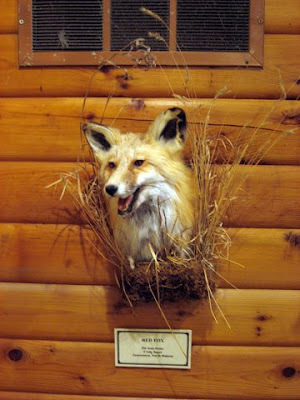 On numerous occasions, I've noticed stuffed red foxes. 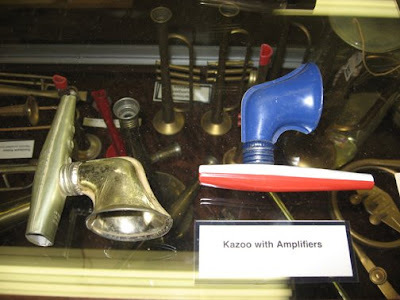 This inevitably makes me think of the great comedian Redd Foxx. 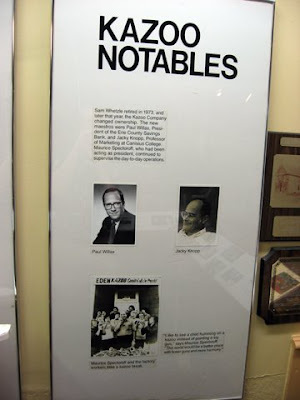 I can't help myself from shouting out "Lamont!" and humming the catchy Quincy Jones "Sanford and Son" theme song, as the poor mounted woodland creature stares out at me through his glass eyes. 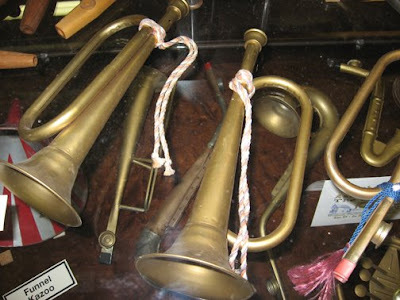 I like a good poop joke as much as the next fellow, especially if the next fellow is 12 years old or Mel Brooks. 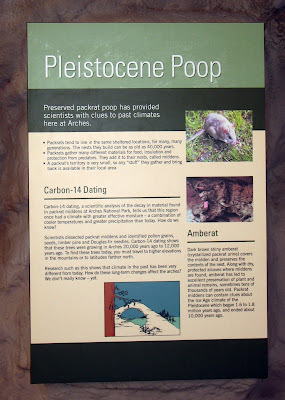 So imagine my delight when the outstandingly beautiful Arches National Park in Utah had an exhibit in their visitors' center referring to packrat poop. Not exactly a joke, but hilarious to the immature-minded nonetheless. 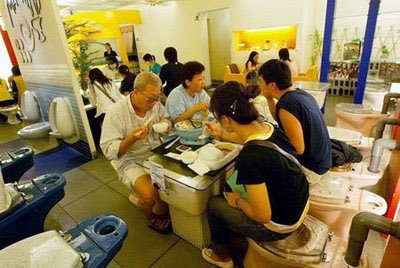 Not excrement, not dung, not droppings. Poop. 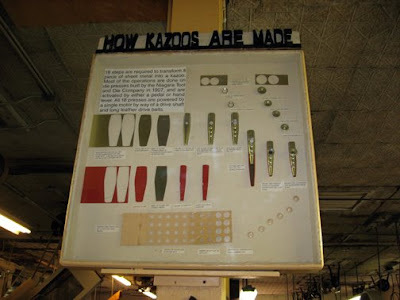 It seems the little critters' "gifts" are crucial in the carbon dating process vital to the scientists and geologists who document how old the park is. 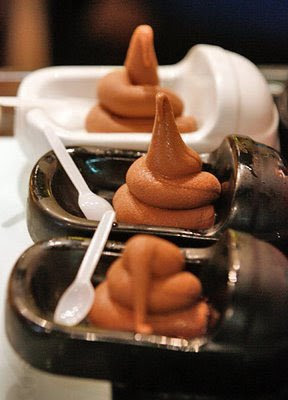 And that's the poop on poop. 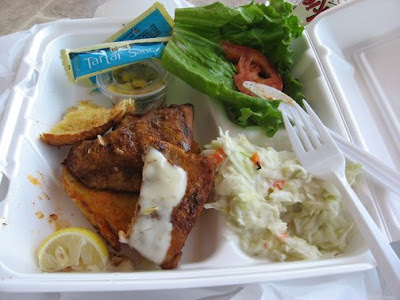 You can't beat a fish sandwich in Annapolis! 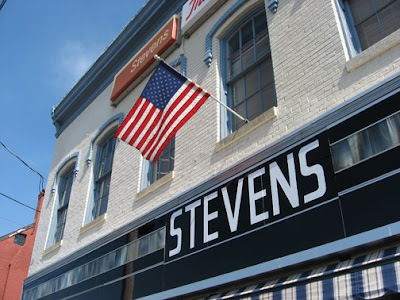 Stevens Hardware: great stuff since 1961! 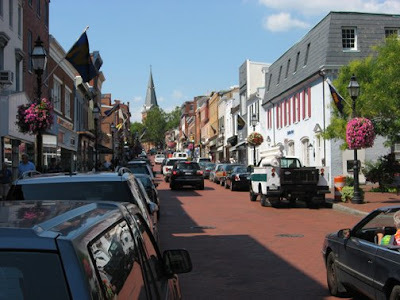 We spent a lovely day in the pretty, well-preserved Colonial town of Annapolis, Maryland in 2007. 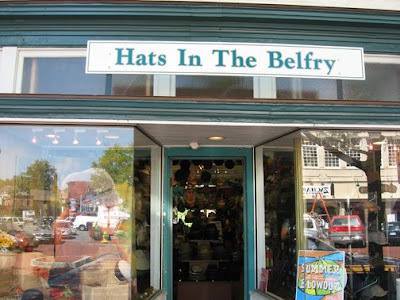 It's a great place to walk around, get a delicious bite to eat and souvenir shop. 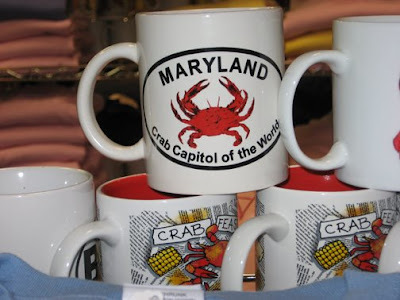 Any place that refers to itself as "the crab capital of the world," as Maryland does, is tops in my book, and the souvenirs bear this out. 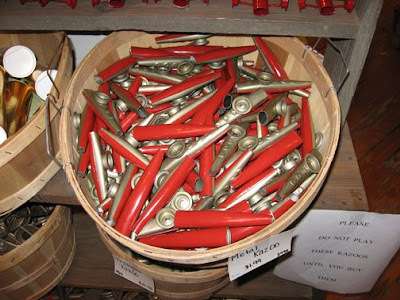 Stevens True Value Hardware store on Dock Street is one of those great American institutions: the downtown independent local hardware store. 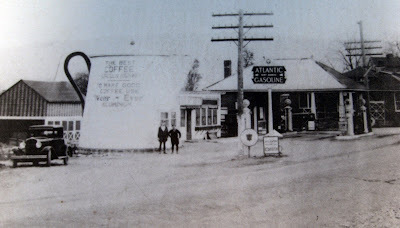 It was opened as a general store in the late 1800s and the Stevens family has been running the place since 1961. 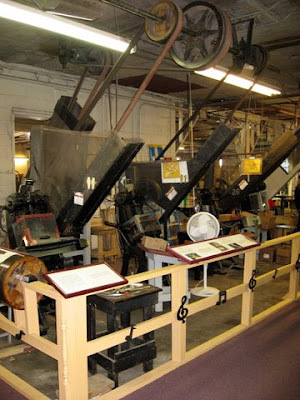 They've weathered the ups and downs of good and bad times, including being flooded by Hurricane Isabel in 2003, and, in addition to the usual hardware mainstays, offer a glittering array of souvenirs for the tourist trade. 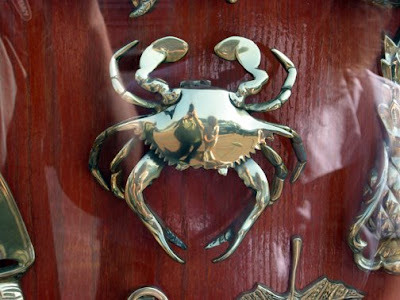 My favorite was the brass crab door-knocker... a real beauty. 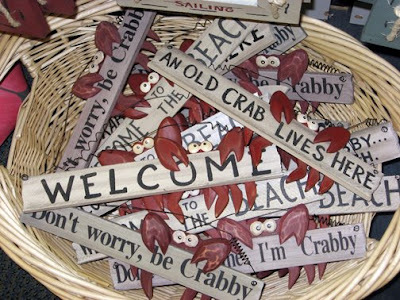 Who doesn't know a crabby person who wouldn't love to receive this as a gift item? 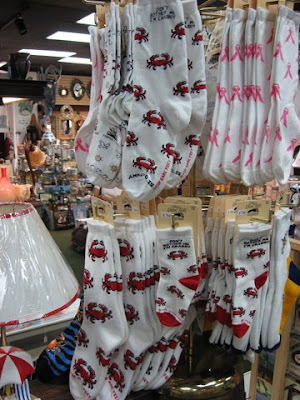 So quit your crabbin' and get down to Annapolis. You'll be glad you did.